WASHINGTON -- Tuesday's midterm elections produced a mixed bag for Democrats interested in regulating the auto industry, with one prominent Senate critic losing her race and another behind in a race too close to call. Democrats regained control of the House, and the resulting power to conduct oversight investigations on subjects Republicans eschewed during the first two years of the Trump presidency. 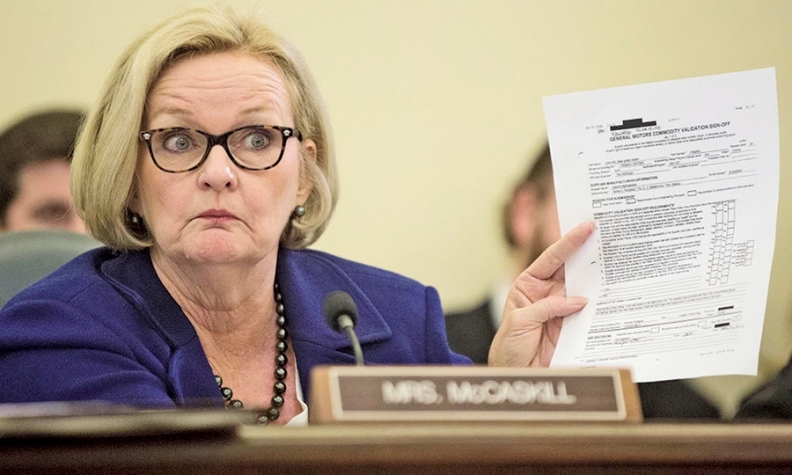 Sen. Claire McCaskill, D-Mo., who publicly scolded General Motors in 2014 for its slow response recalling vehicles with defective ignition switches linked to at least 19 deaths, lost to Missouri's 38-year-old attorney general Josh Hawley. The incumbent was also a vocal critic of how the auto industry handled the deadly Takata airbag crisis, saying it jeopardized lives by underplaying the risk before being forced to undertake the largest recall in automotive history. Sen. Bill Nelson, D-Fla., the ranking member of the Commerce Committee, has also pressed automakers on safety issues and been a frequent critic of NHTSA over the pace of Takata airbag inflator recalls. On Wednesday morning his race was too close to call. With more than 8.1 million ballots cast in Florida, Nelson is behind the current Republican governor, Rick Scott, by about 34,000 votes, or 0.4 percent. Under state election rules, any race that is within 0.5 percent goes to an automatic recount. In Nevada, home of Tesla's massive Gigafactory battery plant, Republican incumbent Sen. Dean Heller lost to Jacky Rosen. Heller recently proposed legislation that would lift the current cap on electric vehicles eligible for tax credits. Meanwhile, Democrats flipped at least 26 seats to take control of the House of Representatives, with several West Coast races still undecided as votes continue to be counted. Democratic Party leaders have indicated they plan to investigate widespread charges of corruption in the Trump administration and to conduct oversight hearings of agency actions that often went unchecked the past two years. Among those who could receive intense scrutiny is Commerce Secretary Wilbur Ross, a key architect of the White House's protectionist trade policies, who has not fully divested himself of major investments that government watchdogs say pose conflicts of interest, and has been accused of having financial ties to Russian oligarchs and stealing money from investment partners. House committees under Democratic chairmen could also use the bright lights of hearings to draw attention to the EPA's rollback of climate protection policies such as tough clean-car standards and California's authority to set its own standards , as well as top official Andrew Wheeler's close ties to the fossil fuel industry. The election means that Frank Pallone, D-N.J., another harsh critic of NHTSA's approach to auto safety, will likely take over chairmanship of the House Energy and Commerce Committee from Rep. Bob Latta, R-Ohio. The new power structure could impact whether the revised trade deal President Donald Trump negotiated with Canada and Mexico gets approved, and whether legislation that would unleash autonomous vehicle development gets passed after being held up by several Senate Democrats over safety concerns. Frank Maisano, a senior principal at the Bracewell lobbying firm, said discussions about greater EV incentives, an issue without clear partisan divides, could now take place in the House and possibly influence the Senate. • Richard Cordray, the controversial former head of the Consumer Financial Protection Bureau under President Barack Obama who took enforcement actions against dealership lending practices, lost his bid to become Ohio's governor. • Bibiana Boerio, a former CFO at Ford Motor Credit Co. and managing director of Jaguar Cars Ltd., lost her House race for Pennsylvania's 14th District. • Haley Stevens, chief of staff for Obama's auto rescue team, won Michigan's 11th district. Meanwhile, congressmen with auto dealership backgrounds won re-election. However, Ohio Rep. Jim Renacci, a former dealer, lost his Senate bid to unseat Democrat Sherrod Brown.